The kids cried last night as my husband and I put them to bed. Cried because they were tired. Cried because they are kids. But cried mostly because we were leaving, while they slept, for New York. This will be our longest trip ever away from the children. And our first since everything in our home has changed. Life operates differently with Mom not working, and undergoing treatment for Lupus. Cuddles are a nighttime ritual. Therapy for worries, a new childhood experience. I explained to the children how important this trip was for me, and for our family. It means that I am getting better. And this trip is a big step in testing to see what my body can handle…and what it can not. I’m pushing many of the what if’s out of my head because I know that my body is ready. My doctor is confident and he wouldn’t have let me travel if he weren’t. This doesn’t mean I can handle this often yet, or even that I will be anywhere near full strength soon. But this is a step. A big step. And one I had hoped would make the children feel more secure, make me feel more confident. Instead this morning my hands shook as I tried to take my pills with a glass of water, and I nearly called off the entire thing before we walked out the door. And nearly called it off again as we drove to the airport. Yet here I sit, on the plane, blogging from the sky and trying to muster the old Erin that usually emerges right about now. I’m just so determined to beat this, so determined to NOT go backwards, so determined to never cause the kids or my husband another thought of fear or pain that even taking this trip has me rethinking everything I do. Everything I am. Everything I WANT to be. I’ve been doing my best to take those baby steps at home, from home, that feel comfortable and natural and don’t disrupt the worries of the household. 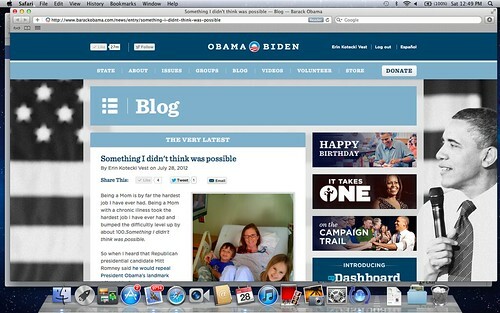 I’m so proud to have been asked to blog for the President’s re-election. And I’m proud to be doing more around the house, slowly, steadily, and with great care. I just wish I could shake this weight in my chest over this trip and all it’s implications. So many fantastic opportunities, so many chances to relapse. So if you see me in New York, and I’m not entirely myself, please don’t take any offense. I currently have a one track mind that includes keeping my voice and hands steady, my head held high, and a fierce determination to turn around and go home if my body says it’s time-regardless of what opportunities I miss. The crying children I left behind, and the man who accompanies me and has stood by my side through this hell deserve that much. In fact, they deserve much more. I’m in control, even through my tears, and I will NOT go backwards. Just don’t be afraid to lower that head ever so much to rest on the shoulders of so many of us who want to hug you or simply offer you a place to lean and rest. xo to you both and to the littles back at home. Cheering you both on from Vegas. You can do it. Rock it out Erin. May you also enjoy some time with your husband. Parenting ain’t easy, much less when you have a debilitating illness. I look forward to seeing what comes next with your cautious emergence.